Follow the journey of the sun across the world from a whale’s eye to a little girl’s window in Bob Graham’s tender, transcendent story. While Coco sleeps far away, the sun creeps over a hill and skids across the water, touching a fisherman’s cap. It heads out over frozen forests, making shadows in a child’s footprints, and balances on an airplane’s wing for a little boy to see. The sun crosses cities and countrysides, wakes furry creatures, makes a desert rainbow, and barges into Coco’s room to follow her through a day of play. With an eye for capturing small moments of shared experience, Bob Graham illuminates the natural wonder that comes with every new day. Bob Graham is the author-illustrator of many extraordinary books for children, including How to Heal a Broken Wing and The Silver Button, about which School Library Journal said in a starred review, “Graham celebrates what can happen in a single moment and reminds readers to pause and observe.” Bob Graham lives in Australia. The drawings are deftly unfussy, with an easy command of the watercolors. Their deliberate pacing recalls Mitsumasa Anno, and in their grand compass they are like a big, Whitmanesque hug...It's great to be able to count on something; readers can count on both the sun and Graham. In the soft wash of hues that form the backdrop to most of the scenes, Graham (Vanilla Ice Cream) captures the moment of daybreak with gray-blue and rosy pink ceding to bright yellow across the sky. Seeing the same instant from widely dispersed viewpoints will elicit a sense of both familiarity and discovery for readers. ...its viewpoint fits naturally with kids’ tendency to put themselves at the center of the universe. Graham’s beautifully illustrated tale conveys with exquisite simplicity that the world is shared, its sunlight a gift for everyone. In this joyous celebration of the world, the sun travels to a special child. Students will be pulled into the story and will go back to look at the pictures again and again. The sun illuminates the little things in life that we may otherwise miss. Young students will find new ideas in the illustrations each time they read this story. 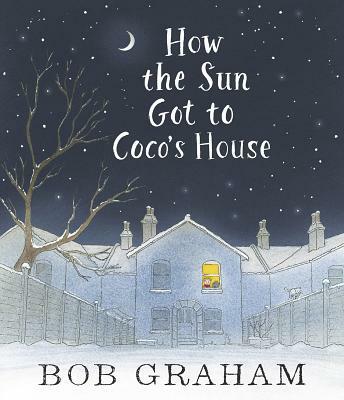 In his usual charismatic style of writing and illustrating, Bob Graham has spun a highly creative, thought-provoking story about the rising sun. Bravo!